Try this Carnation twist on a classic Italian pasta dish. 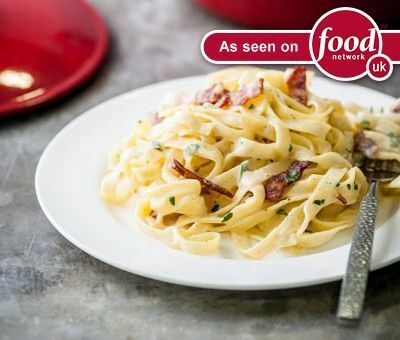 Bring a large saucepan of water to a rapid boil before adding the tagliatelle. Bring back to the boil and cook according timings in the instructions. Brown the bacon in a large, non-stick frying pan. Add the onion and garlic and cook. Pour half the Carnation Evaporated Milk into the pan and simmer for 3 min. Place the rest of the evaporated milk into a bowl with the cheese, parsley and egg and whisk together. Strain the pasta, cover to keep warm and put to one side. Add the egg mix to the pan and stir on a low heat for 2 min Tip the pasta into the pan and toss through the sauce. Serve with the freshly cracked black pepper to taste. Ensure pasta is piping hot throughout. This is a lovely creamy meal, I added diced chicken which I think made the meal a lot better. I will be making this again but will use 1 clove of garlic as it was little too strong with 2. The kiddies loved it!